For a few nights ive been kept awake with what I can only describe as an electric shock on the top of my left foot (where my laces would tie on my trainers)... I go to sleep fine but am woken around 2 with this awful stabbing pain, just like an electric shock... I am so so tired and irritable, thinking about going to my gp but im sure she will not understand whats going on. The only way to relieve this is to get out of bed and stand up, weight bearing seems to take the pain away. The area on my foot is actually sore to touch, it seems a surface pain, nothing deep in my foot... I think I might have had this occasionally before but never keeping me awake like it is now....During the day it all seems fine although today ive had a couple of "tweeks" but all is well when I stand up.. happy to try anything to help this go away...... oh im early 60's, retired but fairly active, female and ive been on oral chemo for nearly 2 years now. Cant think of anything that has recently changed, im just so so tired. I actually replied to your post, but in this section of my site I can go into more detail. If you choose to see a doctor about this and I think you should simply because of how painful your foot is, then you need to see someone who specializes in the foot. You are correct in your assumption that you GP may be clueless as to what is going on and just write it off as arthritis. You should really read my section on midtarsal fault as I think that is where you will find answers. The electric shock that you describe that originates from where you tie your trainers is more than likely an irritation of one of the superficial nerves that travel down the top of your foot, thus giving you sensation on the top of your foot and toes. Looking at the diagram I included, the black arrow points to the superficial nerve (yellow), while the black circle is where I think your pain is originating from. electrical shocks that travel down your foot. Without shoes or socks on, take one finger and tap it in the area where you lace your shoes and see if you reproduce the pain; if so, it is probably a trapped nerve. Perhaps the bigger issue is why are you having this problem and what can be done to alleviate it. As I said earlier it could be from bone spurring or it could be just from tying your shoes too tight. Now, if it is from bone spur formation rubbing on the nerve, more than likely the problem is because you have a flat foot. Not necessarily when off your feet, but when you stand up, your arch collapses. This collapsing, over time, causes a jamming effect of the two bones that make up the apex of your arch. This repeated collapsing causes excess bone growth and thus the growth of bone spurs. The treatment for this is the use of an orthotic to keep the feet from over collapsing, in doing so, the bone spurs are not going to disappear but worsening should not occur. I would be remiss if I did not mention the fact that if you happen to have a very high arched foot, that too can cause a nerve entrapment since the high arch leaves very little "wiggle room" for you to lace your shoes with any degree of tightness. As I said in your post that I answered, if you are in as much pain as you state and it turns out you have a nerve entrapment, which is the nerve embedded in scar tissue, then a cortisone injection may be very helpful. Additionally, some people present with the same type of symptoms and in addition to the nerve irritation may also have a ganglion cyst and to a lesser extent an inflamed bursal sac (bursitis). These two conditions should also respond to a cortisone injection. In real severe cases of this type of pain that do not respond to conservative therapy, surgery may be indicated. Depending on the actual diagnosis certain procedures may be performed to try and dissect the nerve out of the scar tissue and free it up. If there is excessive bone spurring, that too may be removed. If there happens to be a ganglion, that may be removed as well. So I hope you can see that you need an accurate diagnosis in order to deal with this problem and the only way you are going to get that is to see someone who specializes in the foot. Your answer to the lady with the "shocks" ignored what I think would be the most pertinent detail. She has been on oral chemotherapy for 2 years. I was in palliative care for 6 months -originally given a prognosis of 3 days - a week. My immune system had collapsed and there were many infections -parasitic and bacterial ..in my blood and gut. A myriad of cocktails infused via PICC line was needed to kill everything -some of these were chemotherapies. Enough about that -it was 2011. Fully recovered I have pharmaceutically induced neuropathy mostly in my feet. As explained by my neurologist -these chemotherapies attack the longest nerves in the body -which are the legs ...hence -the feet. It changes the way it presents ...sometimes I have touched the top of my foot and experienced that ELECTRIC SHOCK she describes. The medication she is taking ought to be ruled out as the culprit before going into other workarounds and treatments which could waster both time and money. Walter, you are correct in your assertion that one of the side effects of chemotherapy is peripheral neuropathy. I have had many patients over the years that suffer from neuropathy as a result of their treatments. Typically their neuropathy is bilateral, both feet and legs. Having said that, in this particular instance, the women in question suffers from a neuritis which is a nerve irritation at a specific location. In many instances it will be caused by people who are athletic and tie their sneakers (trainers) too tight, generally at the crest of the arch thus entrapping the superficial nerve that runs down the foot and ends up causing the electrical shock. Typically, if you tap your finger over the affected area, it will send a "shock" down her foot and end between the first and second toes. Since her problem is relegated to one foot, and occurs in a specific area of the foot, I would still lean more towards a local nerve entrapment rather then chemo induced neuropathy. Secondly, as I am sure you are also aware, with the exception of medication with side effects, and possibly nerve stimulation, which has a spotty track record, there is not all that much you can do for chemo induced neuropathy. Since I would still lean more towards a local nerve entrapment, I do not think it would be a waste of time and money to pursue that avenue. The good news is that to treat her problem medically, she would have to see a doctor in the UK, who would then be able to make a more accurate diagnosis. Ive been diagnosed with Spinal stenosis four months ago, after months of agrevating pain in my back, down my legs and into my feet. The past month I have such pain on the top of my feet, I can barely stand on them when I awake in the morning. I work a job where I’m on my feet all day, but no one else seems to experience this pain. I’ve had to leave work several times due to this. I’ve had two spinal cortisone shots and have one left. Can anyone tell me if this is from my back diagnosis? This may very well be a local problem and not related to your spinal stenosis. The only way to know for sure is to make an appointment with a foot specialist. Thanks doctor. Your thorough summary was very helpful. The sudden stinging shocks on the top of my left foot radiate along the inner side of the arch on my foot. I saw a foot doctor several years ago. He said I had flat feet and recommended that I wear pads in my inch high shoes for whatever my symptoms were then. All was fine and now the above symptoms. Holding pressure on the area seems to help. Is this the same condition you wrote about in your above comments? Do you have any other comments or do I need to go to a foot doctor to get a cortisone shot, etc. Your thoughts would be much appreciated! There is only so much information I can give you from the other side of the internet. Why not consult with a local doctor? 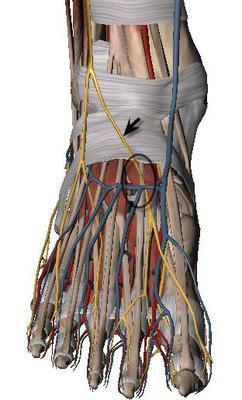 If you can reproduce the "electric shock" by simply running your fingers along the top of the foot in a specific area, more than likely you have a nerve entrapment of one of the superficial nerves that run directly underneath the skin. In most cases this is caused by a history of lacing your shoes too tight. It is annoying and there is treatment for it, but you will have to see a foot specialist. This is exactly what I have experienced. My docotr said it was tarsal tunnel, but I have been doubtful as the pain is never where described for tarsal tunnel symptoms. Apart from go barefoot how do I stop it? Sometimes it goes on for weeks, getting worse until it travels up the leg, accross the body into the shoulder. I was prescribed huge doses of ibuprofen, whichi have since learned via news items, isnt safe. The picture looks like where my pain exists. The pain is not steady but a shock every 15 to 30 seconds. Last night was the first time. I am 77 years old. I had an ankle fracture and wore a boot for 2 months, now the boot is off and everytime I move my foot I get a sharp like and electric shock on the top of my foot for a few seconds it takes my breath away, could I have a pinched nerve from the boot???? if so what can I do? ?